It wasn’t easy for Dunkin’ Brands Group to launch a bid in the fourth quarter of 2018 to become the Target (a retailer known for its premium-like products at an affordable price) for the espresso coffee category. But Dunkin’ — as it now wants to be called — managed to pull it off and stands to carve out a nice niche this year in a strong premium coffee market. Launched on Nov. 19, Dunkin’ spent the final three months of 2018 installing new espresso machines in some 9,000 U.S. restaurants. The company claims it re-trained 100,000 U.S. workers on how to use the new machines and create a perfect latte. The lattes can cost in the $2 to $4 range depending on the exact order and if there are any promotions. That’s a far cry from the $5-plus prices for a snazzy latte from Dunkin’ rival Starbucks. Heck, a trip to upstart premium coffee player Blue Bottle could set you back more than Starbucks. This writer has been generally pleased by the taste of the Dunkin’ espressos. Do they taste like a $7 coffee? No. But they offer enough theater (as presidential hopeful and former Starbucks CEO Howard Schultz would say about drinking Starbucks), taste and caffeine kick to be well worth the price on the check. If anything, Dunkin’ should be closely monitoring its line speeds at these 9,000 stores. We have found the lines at several locations to be a little slower — during peak hours — because these drinks are more complex to make. But hey, an espresso beverage at these price points are a great way to bring in younger consumers. Nothing wrong with waiting a few extra minutes to save $3. 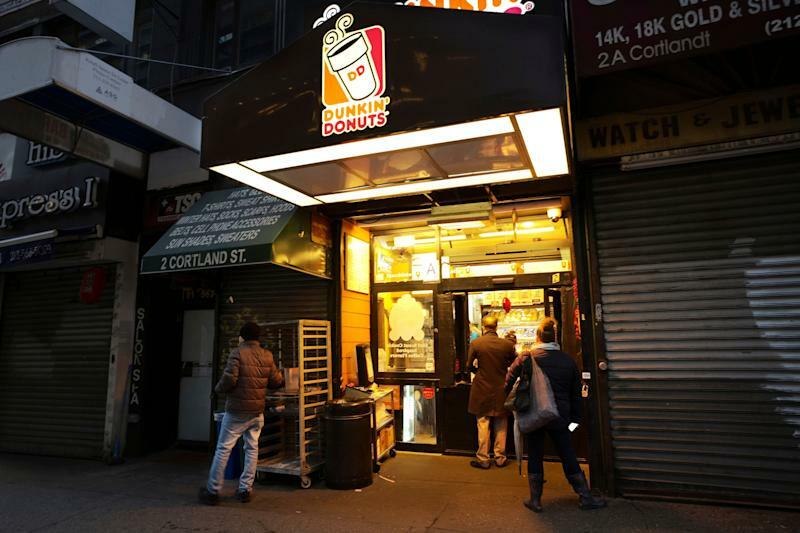 Dunkin’ Brands Group CEO David Hoffmann told Wall Street analysts on a conference call that espresso brought in new sales and more traffic to the restaurants. Espresso represented 200 basis points of Dunkin’s overall coffee sales in the fourth quarter, pretty good considering the products only debuted in November. The espresso rollout did have a short-term impact to Dunkin’, however. Dunkin’s fourth quarter earnings beat Wall Street analyst forecasts by 7 cents a share, driven by operating margin expansion at Dunkin’s U.S. and international businesses. The company’s bottom line was also boosted by an 8.7% drop in share count as Dunkin’ bought back its stock. For the year, Dunkin’ repurchased about $680 million of its stock. Dunkin’ U.S. saw same-store sales unchanged despite a rollout of the new espresso-based beverages. Hoffmann told Yahoo Finance the company pulled back on promotions in the quarter in order for employees to get used to making new espresso beverages. That likely weighed on traffic to the restaurants in what was a very price competitive fast-food backdrop to end the year. Hoffmann declined to say if the new drinks are starting to steal business away from Starbucks. It looks like Dunkin’ is.